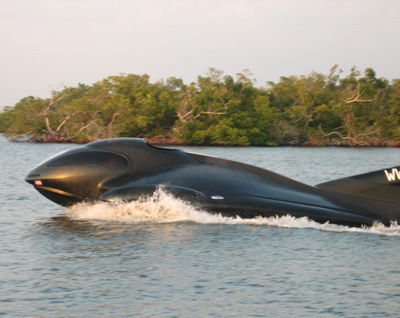 The SeaPhantom from Maritime Flight Dynamics INC. is a speed boat based on NASA's Lifting-Body Airfoil design. 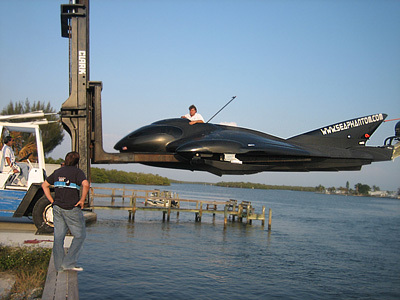 This offers an aerodynamically stable platform for fast aquatic craft. Hydrodynamic lifting surfaces mounted in the hull provide the SeaPhantom's pilot with passive response to variable sea conditions, and help to smooth out the impact of the waves. Design objectives for the SeaPhantom included the elimination of active aeronautical control surfaces to simplify the pilot's job. 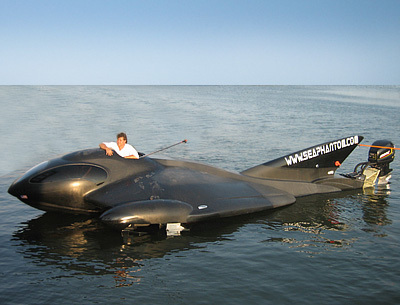 Basically, the craft's built-in stability systems - including automated computer controlled gyroscopic feedback- means the SeaPhantom can be operated by anyone familiar with high performance offshore powerboat operation. Several computers operate quietly in the background sampling the SeaPhantom's attitude 400 times per second, automatically balancing the craft until manual override steering inputs are registered. 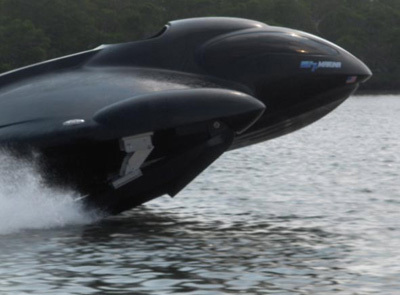 The SeaPhantom is designed to offer speeds approaching that of a helicopter but at the running costs associated with offshore powerboats. In the SeaPhantoms futuristic cabin a Mclaren F1 style seating configuration can be found, with 2+2 seating behind. To provide an outstanding field of vision for the pilot there are two large side windows as well as the windscreen. Wide-angle cameras relay video to a cockpit mounted screen to cover the remaining blind-spots.